I found this book on Christmas Eve when I went up to Rehobeth Beach to spend Christmas with my boyfriend and our families. I’ve been trying to read more books for younger readers and this bookstore, Browseabout, has this wonderful section dedicated to those books. I’ve read a lot of books (manga) that come from Japan, but I’ve never read a book about a Japanese character in Japan written by an America author. I know, there’s this whole thing going on about readers attacking authors for misrepresentation, culture appropriation, and poorly done diversity. Honestly, I wasn’t afraid that this book wouldn’t do Japanese culture justice because it seems like the author actually live in Japan, teaching English to Japanese students and asked some of her colleagues to help with the manuscript. The Night Parade was advertised as being one of the employees’ top picks for the month and I decided to give it ago, to see for myself the quality of the book. For a first time author, this book is pretty fantastic! The Night Parade reads like if Hayao Miyazaki was asked to take the elements of The Christmas Carol and make his own story out of it. The descriptions were wonderful, just enough to describe the fantastical characters that Saki runs into without going overkill. As I read the story I could see the scenes play out before me, and for kids with better imaginations than my own I bet it would be fun for them to imagine. In The Night Parade the main character Saki is really the only character that you read about through the whole story. None of the supporting characters really stay long, for instance a lot of the spirits she meets have brief appearance in the story. Her family and a village girl are the only characters that consistently keep showing back up, however, only the village girl has a major role. Saki’s family appears to be there for plot sake, but they play no real role in her adventures between the human world and the spirit world. This kind of story telling is not bad, especially when the major audience is younger readers. However, some older readers may find it a bit harder to read the book like this. For adults, I imagine that Saki would be a little hard to follow because of her abysmal personality. However, I don’t that middle schoolers or younger would notice how annoying her character is at the beginning. For myself, I had a difficult time sympathizing with Saki because she seemed to make a lot of poor decisions for all the wrong reasons. Her personality does improve over the course of the story, much like Scrooge in The Christmas Carol, but it does take time before some readers begin to notice the change. The pacing in this story is okay for a first time author. There are these long periods in between the intense action in the beginning, which can take some readers out of the story. For me, the pacing wasn’t too bad because I’ve read enough stories with similar speeds that it doesn’t bother me as much. However, for readers who thrive off of action, they may wither some in the long lulling periods, towards the end though the action picks up and stays pretty consistent till the end. Younger readers may find this pacing kinda boring, but I believe if read to or a loud, the pacing wouldn’t be much of an issue. The one issue that I had with the plot was that not everything was fully explained. There were just things said or done that were briefly mentioned in the story with no follow through. It was as if the author wanted to write more on those issues, using them to drive the plot more, but then abandoned ship early and then forgot about them. There was even a character that all the spirits kept mentioning throughout the story but you or Saki never meet them, the character never shows up and plays only the role of a boogeyman. It was a little frustrating, because I wanted to see where the author took us with those things but they didn’t go anywhere, but I don’t think a child would notice these things as much. 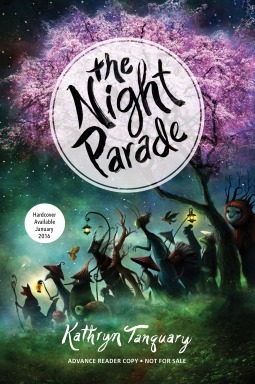 I’ve already recommended The Night Parade and even gave my copy to a friend of mine to read. She’s an exchange student from Japan who was eager to read the book because it is uncommon to see an American author write a story set in Japan with Japanese characters and culture. So I can’t wait to get her opinion on the book! For young readers, I think this is a great book for them to read. It allows their imaginations to run wild, while showing them a different culture and teaching them various lessons. Depending on the age, it may be better for the book to be read aloud by an adult to combat the boredom that the pacing may bring. It would be a great book for a teacher to read to their classes, especially if they’re good storytellers. I would recommend this book to adult readers who don’t mind a bratty main character. Saki does change, but her personality and actions may be too much for some older readers to handle before she starts to grow as an individual. For those who don’t like kids, or just the annoying ones, this book may not be the best pick for you. Overall this is a fantastic book, especially for a first time author! The storytelling had beautiful imagery and the descriptive language wasn’t too complicated or long winded. The various characters that our main heroine ran into were unique and interesting. Some minor characters were more memorable than others, but overall they were well done even though they didn’t stay long within the story. The pacing is a bit off and there were some aspects of the story that seemed more important than they were, or were just abandoned all together. However, for a first book the author did a fantastic job telling a story that reads like the brain child of The Christmas Carol and Hayao Miyazaki. I believe that fans of both will find enjoyment from The Night Parade! The story’s premise sounds very interesting. It’s cool that this novel is set in Japan. Great review!